upcoming Mountain Hollow Farm Yarn Retreats & trips! “All Yarn, All Weekend” – that’s our motto! Spend three relaxing days perfecting your craft in the beautiful Appalachian Mountains. Our yarn retreat is the perfect weekend getaway. The lodge at Pine Mountain State Resort Park is the perfect setting for our gathering. It is surrounded by woods with beautiful trails for hiking and catching glimpses of the local wildlife. Delight in the company of other fiber artists while taking a break from the rigors of daily life. To extend your retreat, arrive on Thursday and join us at Mountain Hollow Farm for the day. Thursdays are our social day in the store. Bring whatever project you’re working on and come hang out with us. Depending on the weather and our whim, we can either gather in the pavilion or cozy up around the table in the store. This is a wonderful opportunity for you to hang out with us, explore the farm (Beth is always happy to talk farming), and make new friends. The retreat registration fee covers everything except your room and it is payable to Mountian Hollow Farm via the link at the bottom of this page. Your room reservations must be made directly with Pine Mountain State Park, and is explained below. All meals from supper on Friday through breakfast on Sunday. Show & Tell – It’s always a hit! Bring one item you made and show it off to the rest of us. We will also be doing an optional mini knit along & crochet along. This time we are doing small felted project bags. We are in the process of test knitting and crocheting these bags. When we are done, we will post the project kits for purchase and send an email to notify you that they are available. Make room reservations directly with Pine Mountain State Park by phone or online. Call (800) 325-1712 anytime. 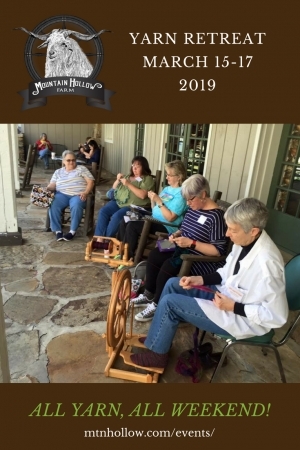 Mention “Mountain Hollow Farm Yarn Retreat” or group code 1787 to receive these special rates. Visit Pine Mountain State Resort Park’s web site. Use group code 1787 to receive these special rates. Note: There are many steps at this resort and handicap accessible rooms are limited. Each 2-bedroom cottage has a living room, fully-furnished kitchen, and a private porch or deck. Each bedroom has 2 queen beds (total of four beds). Each 1-bedroom cabin has an open floor plan with a stone fireplace separating the bedroom (with one queen bed) from the living room and kitchenette. All cabins also have a private deck. NOTE: If you’ve been to prior retreats and registered online, there will be a note below that you have ticket(s) for this event. These ticket(s) are probably for past retreats, not for the current retreat. If you are not sure if you registered for THIS retreat, click the “View your Tickets” link to check the date(s) of your prior ticket(s). Any ticket(s) for THIS retreat will have a date of November 2, 2018 or later. Other times by chance or appointment. 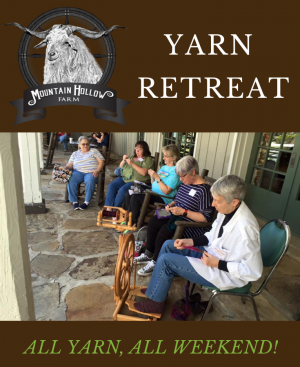 Sign up today to receive notifications for upcoming Mountain Hollow Farm Yarn Retreats!